There is exactly one reason that we’re doing a review of this game today: we saw it in Essen the last two years, we got curious, we tried it, we bought it. This is not a game you’re likely to find in your local game shop, no matter how friendly it is. It’s not a game you’ll see advertised on TV or in newspapers. And you’d have to be quite lucky for someone to bring it to your gaming night. You can actually get it on German Amazon, but it’s not a well-known game. Which really is a shame, because ebbes is fun. ebbes, in the dialect of Germany’s Palatinate region, means something. Not something as in anything, “something”. You can imagine the confusion when someone asks to play a round of something in the area. But probably that’s how the name came about, designer Klaus Geis said to his friends “I have ebbes to try”. It’s a little something, ebbes is not a big or complex game, just a quick trick taking game with a fun twist. 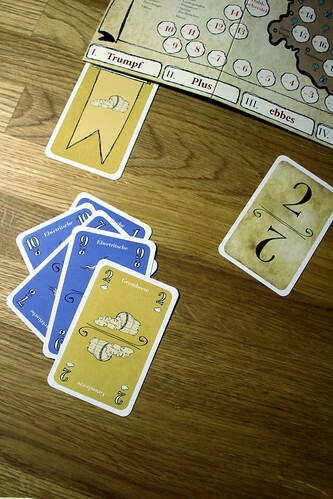 The basic rules are like most trick-taking games: one player starts the trick by playing a card, the other players have to follow suit if they can. 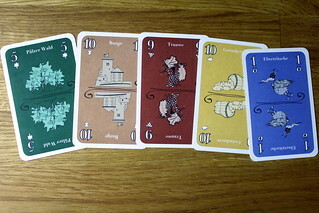 When all players played a card, the one with the highest card in the original suit takes the trick and will maybe score points at the end of the round. I say maybe because, at the start of the round, no one knows what will score points at the end. There is no trump suit at first, either. Those things are only discovered during the round. One card value is special for each round, and when a card of that value is played, that card’s color will take on a special function. Let’s say the special value for this round is five. The first five that is played during this round will determine the Trump color, all cards of that color are now trumps – including the five itself. The second five played this round determines the Plus color. All cards of that color in tricks you win this round, including the ones already taken, will score one point. Third five tells you the ebbes color, the color where you want to have something, meaning neither the most nor the fewest cards. Everyone in between scores three points. Five number four gives you the Minus color, which is pretty much like the Plus color only less good for your score. Finally, the fifth five shows the Nix color (dialect for nothing, translated as zilch in the English rules) is not worth any points, but the player with the most Nix cards decides who will start the next round after seeing his new cards. When all cards have been played, points are counted, cards are shuffled and the next round starts. The standard game lasts five rounds, with a different card value being special each round. The highest total score unsurprisingly wins. Just as unsurprisingly, to be on top of the end will require some luck. ebbes is a trick-taking game, and if the cards don’t like you, you don’t stand much of a chance. At the same time, you also need some tactics to collect points yourself, preferably while giving Minus cards to an opponent. Rules variants offer options for a more risky game where special cards are determined later as well as a more tactical game where each player picks one or two cards, color and value, that will set card functions. Of course, none of this changes the fact that ebbes is a simple, basic game. It might not be what you want to play with your gamer friends on a long afternoon, but it’s a great game for in between and plays very well with family while chatting, even with parents and other older relatives who will never place a worker or build a deck in their lives but are not averse to the idea “ebbes ze spiele” (to play something). I really like ebbes, and that’s even before considering that part of the profit goes to a local youth center.